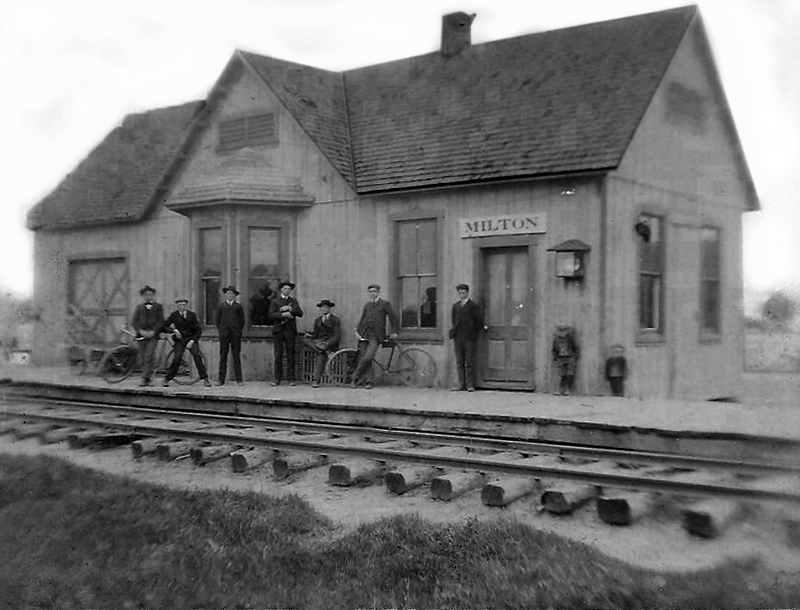 The Milton Historical Society has several prints of this particular photograph, but we’ve recently discovered one of these that had information about when it was taken and by whom. Notes provided by John Leon Black (1888 – 1958) give the date as 5/3/1904, and the photographer as H. J. Lowe of Delmar, “when we were both at school.” J. L. Black was a first cousin to Lydia Black Cannon. The photographer’s full name was Hollis Jackson Lowe (1885 – 1937) , and in 1904 he was still in high school, but somewhat older than the average teenager to have been attending. J. L. Black would drop out of high school at the end of his sophomore year, but would ultimately take over his father’s general store in Milton after the latter’s death in 1920. Lowe would go on to the University of Delaware at Newark, Class of 1910, and graduate with a degree in civil engineering. Looking closely at the faces in the photograph, all but two appear to be in their middle to late teens (ignoring the the two urchins hiding by the side of the building). What is striking, though, is that there are two bicycles in the picture, something rarely seen in Milton photographs from that era. 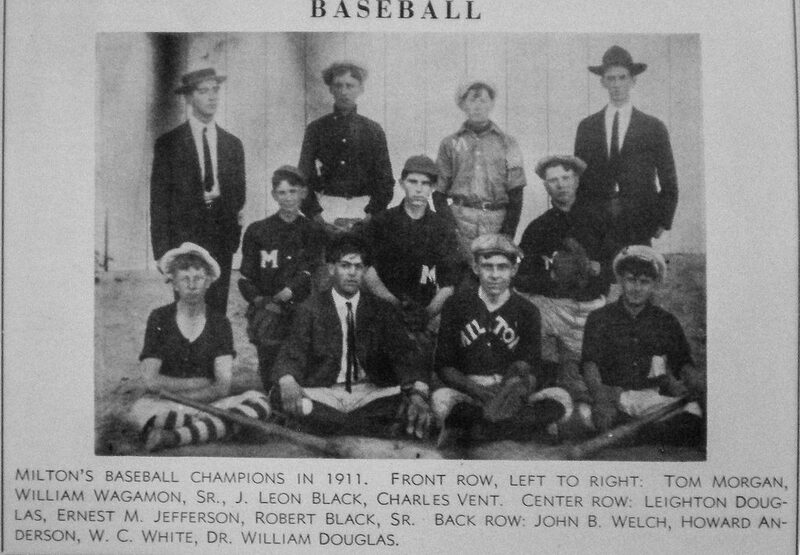 The photograph of Milton’s champion baseball team from 1911 shows J. Leon Black in the front row, third from left. Dr. William Douglas, who took many of the iconic Milton photographs of the early twentieth century, is in the back row at right. His younger brother Leighton is in the middle row at left. Another curious photograph was published in newspapers of the day in 1907, and showed the Milton graduating class of 1907. There is, however, a problem with the captioning: according to the May 31, 1907 Milton News letter in the Milford Chronicle, there were five graduating seniors that year. 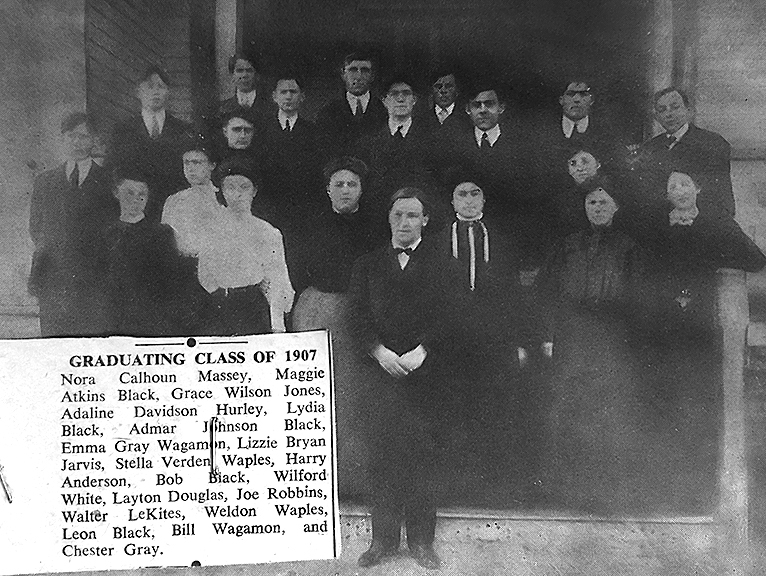 The newspaper photograph shows quite a few more students than that; one of them is J. Leon Black, as well as his cousin Lydia Ann Black. This purported photograph of the Milton High School graduating class of 1907 appears to be showing the entire high school student population of that year; there were only five graduates reported in the Milford Chronicle Milton News letter of May 31, 1907. Five in the graduating class is a substantial number for that time.